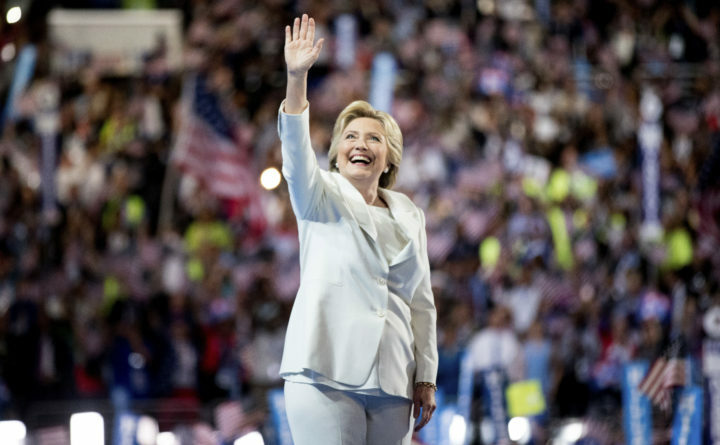 Hillary Clinton at the Democratic National Convention in Philadelphia, Thursday, July 28, 2016. The attorney behind a political action committee backing President Donald Trump is accusing the Maine Democratic Party and its counterparts in 32 other states of engaging in an elaborate money laundering scheme to benefit Hillary Clinton during the 2016 election. Dan Backer, attorney for the Committee to Defend the President, in December filed a complaint with the Federal Elections Commission alleging $84 million in illegal donations. But he has since sued the FEC in federal court in Washington, D.C., in an attempt to compel the notoriously plodding election law enforcement agency to investigate a fundraising agreement that involved most Democratic state party committees. In an interview with Maine Public Radio, Backer said Democratic committees conspired with Clinton’s campaign to exploit rules that allows state party committees to transfer unlimited sums between one another to circumvent individual donor limits and funnel the cash back to Clinton’s principal campaign committee. He also said the state committees never had custody of the money. Scott Ogden, a spokesman for the Maine Democratic Party, declined to comment on the FEC complaint or provide the party’s response to it. “We, like 32 other state parties across the country, participated in the joint fundraising agreement because it helped strengthen our state party apparatus, along with that of the Democratic National Committee,” Ogden said in a statement. Paul S. Ryan, an attorney for the campaign finance transparency group Common Cause, has often been on opposite sides of Backer in election law disputes — including the 2014 landmark McCutcheon v. FEC decision that he says gave rise to the fundraising scheme now in Backer’s crosshairs. Ryan told Maine Public Radio that Backer’s “chickens have come home to roost,” but he also sees merit in an FEC investigation. “There’s a lot of smoke here. There may be fire. There may be some actual violations of federal campaign finance law. And at a minimum — at a bare minimum — the FEC needs to open an investigation,” Ryan said. Backer’s complaint centers on cash transfers that took place throughout the 2016 campaign between Democratic state parties and the Hillary Victory Fund, a joint fundraising committee that solicited big donors and distributed their contributions to the various committees involved in the agreement and, in some instances, produced ads promoting Clinton, or defending her against attacks by the Trump campaign. The Maine Democratic Party’s participation in the fundraising agreement was first reported by the Maine Center for Public Interest Reporting early in 2016. The nonprofit news organization also found that the money the party received from big donors was almost immediately transferred to the Democratic National Committee. The quick transfers raise questions about the state committees’ participation in the joint fundraising agreement, which are billed as arrangements that mutually benefit its participants. Yet little of the money donated to the Maine Democratic Party stayed there, according to FEC transaction records. Backer’s FEC complaint shows over $2.4 million was transferred from the Hillary Victory Fund to the Maine Democratic Party, and then almost immediately to the DNC. “Furthermore, as a result of the money raised, the DNC was able to enhance national voter data infrastructure and improve outreach and communication efforts — all of which we benefited from at the state level. It was, and continues to be, our opinion that strengthening Democrats at both the state and national level is positive for the party as a whole,” he said. Ogden, citing the recent departure of the party’s finance director, was unable to quantify how much money from the joint fundraising agreement stayed in Maine to support its 2016 organizing efforts. Federal finance records show the Maine party received just over $3 million from the Hillary Victory Fund in 2016 — roughly $600,000 more than $2.4 million Backer says was immediately transferred to the DNC. However, it’s unclear how the leftover money was spent. Backer also noted that some of the transactions between the state parties and the DNC didn’t match. He noted one such case in Maine, in which transaction data showed the state party sent a $15,000 donation to the DNC before it arrived from the Hillary Victory Fund. “The money was papered to make it look like it passed through state committees,” he said. Ryan, the attorney from Common Cause, has a different view of the legal issues potentially facing the Democratic committees. He says comments made by former DNC chairwoman Donna Brazile in a book published last year have raised the prospect of coordinated spending. Brazile, in her book “Hacks,” wrote that the DNC was basically run from Clinton’s campaign headquarters. Ryan says Brazile’s comments raise questions about whether Clinton was also controlling the spending of the DNC through the joint fundraising agreement. “For me, that looks like illegal or coordinated spending,” he said. Ryan says the biggest weakness in Backer’s case is pinning it to federal earmarking rules. He says he hasn’t seen evidence that the funds funneled back to the DNC ended up in Clinton’s campaign account. Ryan is also skeptical of state party directors who have since claimed that they didn’t know the fundraising scheme would work the way it did, leaving them little or none of the money the agreement generated. And he said there was plenty of incentive for a state party committee to participate, even it didn’t get much of the cash. Joint fundraising committees, or JFCs, have been routinely used by aligned political committees — and required by federal law when those groups jointly raise money. But Ryan says “super-JFCs” spawned from the U.S. Supreme Court decision in the McCutcheon v. FEC case in 2014. The court’s ruling struck down a federal law on aggregate contribution limits from individual donors. During the legal march to the nation’s high court, Ryan, then with the Campaign Legal Center, warned that striking down the aggregate limits would change how joint fundraising agreements are used by political parties and big donors. Ryan’s warning turned out to be prescient. Not only did the Democrats use it in 2016, but Trump and the Republican National Committee did, as well. The Maine Republican Party was not among the state committees that participated in the Trump-RNC fundraising committee. A lower court also warned about the coming of super-JFCs when it sided with the FEC. So did the FEC, but Ryan says the agency mysteriously left its warning out of its arguments before the U.S. Supreme Court in the McCutcheon case. “The explanation I was given by a sympathetic commissioner was that the Commission didn’t want to ‘give a road map for evasion of the limits.’ But the roadmap was in plain view to any half-decent election lawyer,” Ryan wrote in an email. Backer counters that the McCutcheon decision made it clear that what the Democrats did two years later is illegal. Both Backer and Ryan believe the complaint against the Democrats could take some time to resolve. To expedite the process, Backer in April filed a complaint against the FEC that he hopes will force it to launch a probe. A federal judge has given the parties until June to respond. It’s unclear whether the FEC will investigate. Ryan says Republican members of the commission have rarely shown an appetite to enforce election laws, but he says they might relish the opportunity to penalize Democrats and Clinton, a political figure that continues to generate hostility among conservatives despite her 2016 defeat in the presidential election. As for the legal jeopardy facing the Maine Democratic Party, that too is uncertain. Backer describes the case as ripe for inquiry by the Department of Justice. He says the Democratic fundraising scheme is 4,000 times the magnitude of a case involving conservative filmmaker Dinesh D’Souza, who was prosecuted and convicted in 2012 for a strawman donor scheme. Backer says everyone involved in this case should be worried: donors, Democratic fundraisers and party officials who filed the campaign finance reports. “They’re all looking at significant legal jeopardy,” he said. Ryan says it could take years before the case is settled. And in the interim, he says the public will know little about the FEC’s investigation, if indeed there is one.